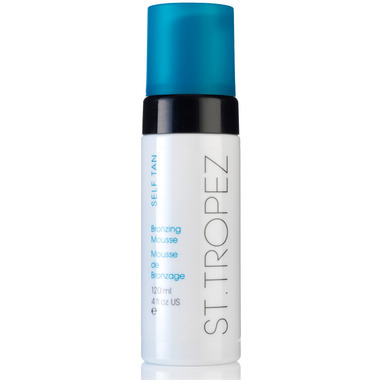 St. Tropez Self Tan Bronzing Mousse is a super-lightweight, easy-to-apply, velvety self-tanning mousse. It delivers an ultra-even all-over tan and sweeps on easily with an Applicator Mitt. This extremely popular St. Tropez self-tanner is perfect for anyone looking to get a natural-looking, streak-free golden tan that dries in an instant. Whether you’re a first-time tanner or a total pro, this tinted formula will ensure you know where to apply your tan for a perfect application, every time. Infused with conditioning aloe vera and long-lasting color, St. Tropez's innovative Aromaguard™ fragrance technology eliminates the tell-tale self tan aroma by a minimum of 70% and instead gives a beautiful subtle, yet refreshing fragrance. Never orange, St Tropez Tan always gives a beautiful, golden color. Directions: Exfoliate before moisturizing dry areas thoroughly (elbows, knees, ankles and feet). Help protect eyebrows and hairline with a little extra moisturizer. Using an Applicator Mitt, pump the Mousse into your Mitt, and apply with long, even sweeps from toes to top. To maintain, re-apply a couple of times a week, nourish daily with moisturizer and smooth your skin with regular exfoliation for ultimate results.